When choosing your hydraulic hoses in Fontana CA, you might not necessarily want to simply replace the old hose. 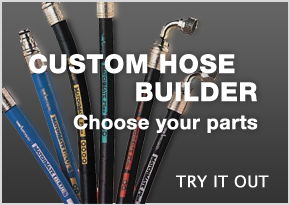 You might be able to get better performance by choosing a different brand or type of hose. Because we carry so many different hoses, we will probably have multiple hoses that will meet your system’s requirements regarding temperature, pressure, and diameter. You may be able to choose from brands like Parker, Eaton, and Waterman. We can also offer hoses with resistances to things like chemicals, heat, flame, and abrasion in order to help extend the life of your hose. For example, Parker’s Super Tough Cover hoses offer 450 times the abrasion resistance of a generic hose. Improper hose fittings and awkward hose configurations are responsible for many hose failures, and we can help improve those too. When a hose fails, your hydraulic system fails. At Bernell Hydraulics, we know that time is money when it comes to most projects that require hydraulic equipment. That’s why we offer 24-hour repair and replacement for all types of hydraulic hoses in Fontana CA.